Growing up, most of us were aware of Whoppers—the candies, not the burgers. They weren't super high on my list of preferred treats, nor were they highly sought after by most of my cohorts. There were one or two oddballs in our class that liked them, but by and large, they seemed to be a snack favored by older generations. 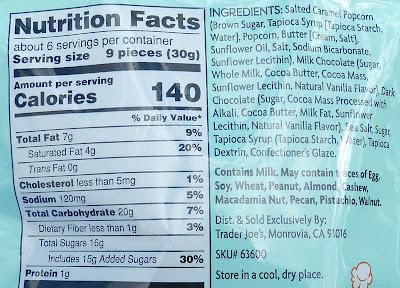 I can even remember my father talking about "malted milk balls" to some of my young friends and I when we were kids. All of us youngsters looked at each other asking, "What the heck is a 'malted milk ball'?" "That sounds gross," we unanimously agreed. 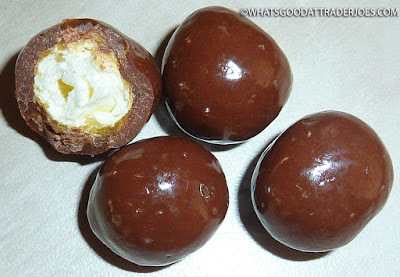 It wasn't until much later that when aged folks would refer to malted milk balls that we youngsters would reply, "Oh. You mean Whoppers." I'd reluctantly consume them when they'd show up in my annual bag of Halloween spoils, but it was rare that I actually wanted or craved a malted milk ball. These coated popcorn pieces are obviously not malted milk balls, per se. However, they remind me of them somewhat in terms of size, shape, color, flavor, and texture—and I feel very much the same about both types of candy in the end. It's hard to hate candies like this completely, but for Sonia and I, it's also hard to wholly embrace them. The crispy inner portion—where the malted milk would have traditionally hidden—has been replaced with popcorn. It's not the first time we've seen this kind of thing at TJ's. Those reindeer dealies come to mind. In this instance, though, we see both milk and dark chocolate. Half of the pieces are just a deeper shade of brown. It takes a bit of discernment to distinguish the two flavors, though, predictably, I do prefer the milk chocolate version slightly if I really pay attention. Sonia didn't care to declare a favorite, although in general, she likes dark chocolate a bit more. 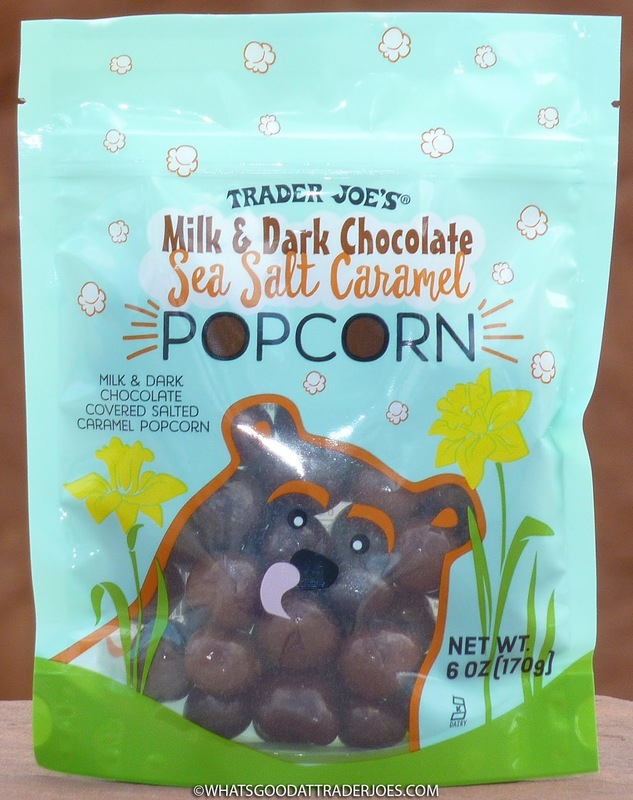 There is a thin layer of caramel between the chocolate and the popcorn, and there is, of course, salt, but both Sonia and I think the chocolate overpowers any "salted caramel" aspects of the candy. I'm not saying it's not there. I'm just saying if you want something to register as "salted caramel," you shouldn't slather it with a bunch of chocolate necessarily. Sonia doesn't even think the popcorn element is prevalent enough. If you're craving something chocolatey and don't mind that popcorn and caramel aren't all that prominent, you still might enjoy these little guys. $2.99 for the bag. Sonia likes the packaging. It's all Eastery and springy and vernal and stuff. I guess Trader Joe's is replacing the Easter Bunny with an Easter Bear because they come out of hibernation this time of year...? Also because bears eat tons of chocolate...? And they hide in fields of daffodils...? Sonia said it was cute. She didn't say it made sense. In the end, these candies just aren't very memorable in our opinions, and we probably won't buy them again. Double threes. Looks like that chocolate shell is way too thick. I think a nice chocolate drizzle is preferable. And I'm the oddball who loves Whoppers. I'm thrown by the word "candies"